It’s here- the final week of Farm Share, accompanied by a rather conclusive frost. We experienced temperatures of minus 7 with clear skies, which spells doom for almost everything left in the field. Even the peppers and eggplants in the greenhouse hang their leaves in defeat. Two surprising survivors are parsley, which looks great save a few stems closest to the ground, and the carrot tops, which are still firm and green. Call me crazy, but this heavy frost gives me a sense of relief from the very physical work of work out in the fields, which gets less appealing as the cold temperatures and fewer hours of sunlight discourage your muscles from cooperating. I wonder- do Canadians have a lower economic output in the winter, because between the cold and dark it sure seems like our beds try to keep us a little longer. I think us Canadians are a hardy bunch in that we do carry on. Maybe we just need some peppy music, a strong cup of java, and some hearty, nutritious meals to fuel us! (Can be modified to be vegetarian as well). A good option for helping a meat-and-potatoes family consume embrace Jerusalem artichokes. Meanwhile, boil medium-sized pot with lightly salted water. Wash Jerusalem artichokes (no need to peel), chop coarsely if desired. Peel and cut medium-sized potatoes into quarters. Add Jerusalem artichokes and potatoes to boiling water and cook until tender. Drain and add 1 cup rice milk or more, a dash of salt and pepper and 1 tbsp. oil and mix with hang mixer until desired consistency. Layer frozen peas over the meat mixture. Then place artichoke mixture overtop and smooth out. Bake uncovered about 30 minutes, until heated through. Heat oven to 400 degrees. Wash and peel squash and beets. Chop them along with potatoes and place in casserole dish. Add olive oil, salt and pepper, and toss to coat. Sprinkle with goat feta. Cover dish (I used a 9×13” glass dish) with tin foil and bake for approximately 1 hour or until veggies are tender when pierced with fork. Enjoy! Makes 6-8 servings. Fellow farm-sharer Keren sent me this recipe. Sounds like the perfect thing to gets some greens into my son. I think I may try it with black kale until we have spinach again. 1. Combine spinach (don’t include any water that’s drained out of the spinach, but you don’t need to squeeze the spinach either) and your preferred broth in a powerful blender or food processor and pulse until smooth. Set spinach puree aside. 3. Add spinach puree to the pan, along with the lemon juice. Cook for about a minute, to bring the flavors together, then add the chickpeas. Continue cooking until the chickpeas are heated through and all of the watery liquid cooks down leaving a puree (with a consistency like baby food). Add more broth if you end up needing to make adjustments to the consistency. Taste and season with salt and pepper. Suggestion: serve with rice. *Note: Be sure to mash or puree the chickpeas into the spinach for babies not yet managing larger chunks. Really, truly believe in local, organic food. Value freshness and taste over cookie-cutter veggies. Experiment with new varieties and get creative in the kitchen for their good health. Reduce food waste and the use of fossil fuels and thus have itty, bitty, carbon footprints. Support Organics for Orphans- an organization which brings self-sufficiency and amazing, nutrient-dense organic foods to some of the most vulnerable people in the most impoverished nations. Remind me with their enthusiasm of why I keep farming and connecting families like yours to our tasty veggies. So thank you, thank you, thank you. You have eaten your way to a positive change this season. May you be blessed with great health to enjoy your every day with the people you love. Phew! So summer’s having a little comeback this week. I hope you are enjoying the sun while we have it. This week I wanted to give you some ideas of how to use all of your veggies for the week, based on some of the tasty meals I’ve made with our veggies lately. I do not follow any specific diet except for the more veggies and unprocessed foods, the better, but I think most of these ideas could be adapted to vegetarian or gluten-free diets. Roasted chicken (legs and wings) and roasted veggies (beets, carrots, potatoes or squash). Roast whole chicken and save the breasts for tomorrow. Spinach, chicken, avocado and strawberry salad with mango chipotle dressing. A five-minute meal if you pre-roasted the chicken! Ground chicken chili (green peppers, tomatoes, zucchini, scallion) with cheese, plain yogurt, and scallions to garnish. Hope these ideas get the wheels in your head turning. Here’s a tip if you are overwhelmed with tomatoes. Wash and put in the freezer in a bag, and simply pull out and use in your cooking later. I made a large watermelon and a few very ripe bananas into juice by throwing it all into a blender, doing a quick blend, seeds and all, and simply straining out the seeds and pulp. I also froze some juice for popsicles for my son. Three weeks remain and I’ve received numerous emails from customers thinking the season is over. This is understandable, as many grocery stores stop carrying Ontario produce at this point because consmers are used to the local options being phased out in early September. Even things like lettuce are being harvested into early October, although a heavy frost could wipe them out. We are still harvesting carrots, beets and kale and still waiting for the Jerusalem artichokes and parsnips to grow a little before harvesting. The brussels sprouts do not mind the frost at all, so I normally wait until the last weeks to harvest them, when I am grateful for a new item to put in your boes. Even sweet peppers and eggplants are living on happily under a frost cover we put up. So, despite the chill that’s in the air, October is still a busy month for harvesting vegetables. So what’s on the menu this week? And for the recipes, now is the time for confort-food. And by comfort food, I don’t mean deep-fried! Some homemade soup is one of the best comfort foods in my opinion. I made a nice potato leek soup which I could have done with more of, with a tweak to the original recipe. Nice and creamy without all the fatty cream! 1. Cook leeks in butter in soup pot. Cover and cook on low about 10 mins. Check often and do not brown! 2. Add water, broth and potatoes. Bring to a low simmer and cook 20 minutes or until tender. Spoon about 1/2 of the soup into blender, puree and return to pot. Repeat with other half. Add spices. Serves 4-6 as a side. My favorite way to prepare beets- makes a colourful side and a great-pleaser. Salt, pepper and rosemary or other savory spices like thyme, sage, parsley, etc. 1. Wash, peel and chop vegetables and place in baking dish (Corningware is perfect). Preheat oven to 375 degrees. 2. Add olive oil and spices and mix together lightly. Cover and bake about 40 mins or until vegetables are tender (carrots and beets seem to take the longest so check them). As the variety of vegetables diminishes a little with the cooler weather, it’s a good time to try out new recipes. You never know when you’ll find your next classic! Thanks for embarking on your local organic food adventure. It’s people like you that have kept agriculture strong in Ontario. I hope it’s been tasty! Wow- are we half way through the season already? Now is a good time to pause and think- am I getting everything I can out of my Farm Share? Please let me know if there is anything I can do to help, and I will try to make it happen if possible. Are you struggling to use a certain item? Let me know and I can post some recipes for that particular item. This week we have watermelon for one and all! Let me assure you that the dark flesh is normal for the variety and the insides are a nice juicy pink like the typical supermarket watermelon. However, our melons get to ripen on the vine, since they don’t have to be harvested before they are ready to get prepared for cross-continental travel. I am sure you will taste the difference! I discoveredsome marvellous tips for selecting a ripe melon from one of our Jamaican workers. Apparently they grow watermelon in Jamaica too, which I think is a little unfair considering they are also able to grow tropical fruits like pineapple. Nonetheless, he introduced me to the “knock test”. While a sizeable yellow spot and more visible pattern emerging on the skin are also clues, giving the melon a knock with your knuckes should produce a hollow sound in a ripe melon, reminiscent of coconuts. I will admit that I may have knocked out a few beats while testing the melons. 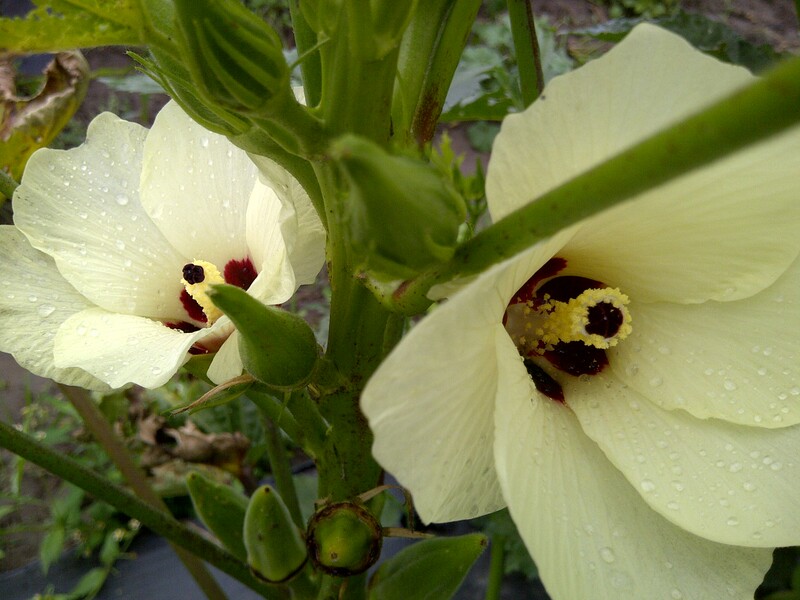 Stunning flowers of the okra plant- nice enough for a bouquet! 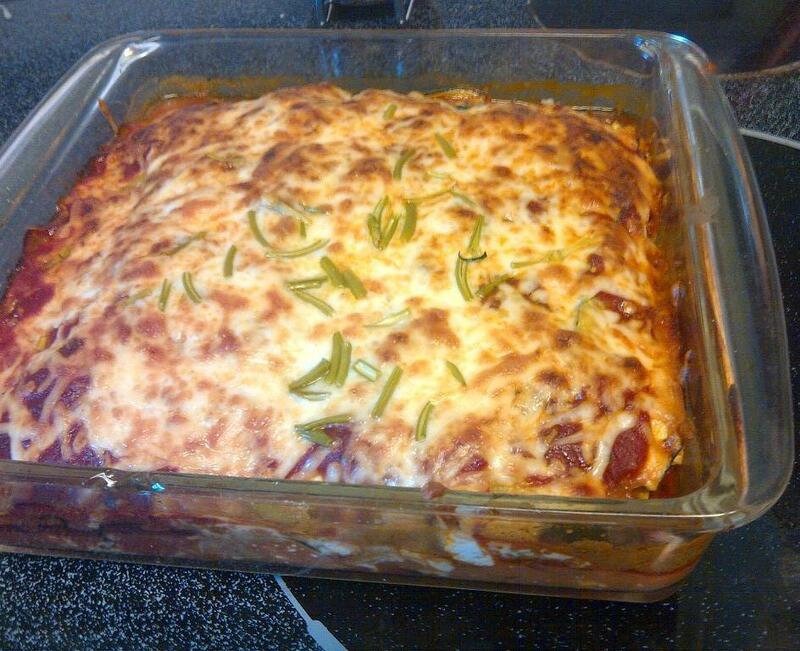 Tasty Lasagna minus the pasta! In a large skillet over medium high heat, brown the onions, garlic and Italian ground round. Sauté until the onions are translucent and the ground round is cooked through (about 5 minutes or so). In the meantime, baste the eggplant slices with olive oil and broil until they are brown around the edges and soft in the center (about 2-3 minutes per side). Remove from oven. Bake for 30-40 minutes. The top will be golden and it will be bubbling around the edges. Serve with salad. Beef, Beet and Cabbage Soup from www.yummly.com with some extra veggies. Beef, beet and cabbage soup. Not the world’s prettiest photo, but it was easy, tasty, and satisfying. I made this up to use leftover beets and other items in my fridge and have something to eat after a long day on the farm. I heated some fresh crusty buns that I had frozen in the oven, and they tasted like freshly baked bread, which made for a nice accompanyment. 1. In a large skillet over medium high heat, heat the oil and add the beef chunks. Brown about 10 mins. and trasfer to slow cooker. 2. Add onions to pan and cook about 5 minutes. 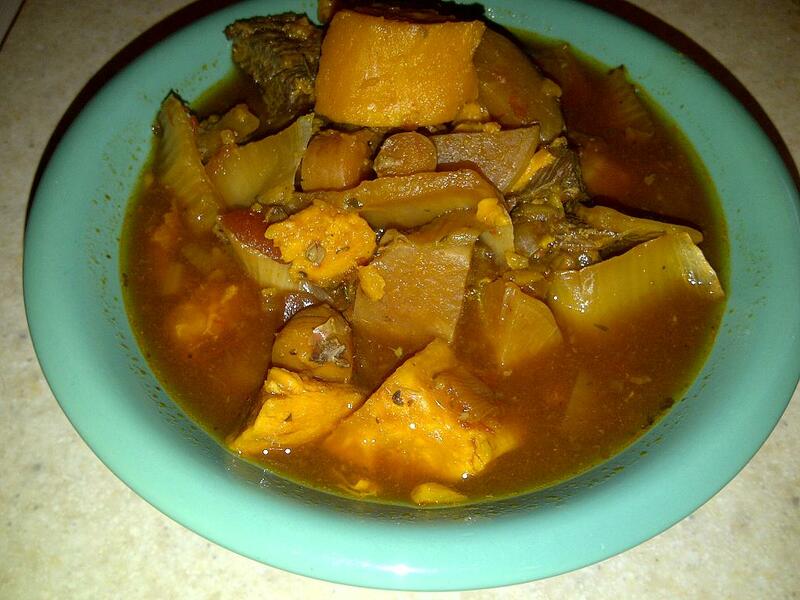 Add to slow cooker with remainder of ingredients. 4. Come home to a nice, hot, home-cooked meal and serve with fresh bread, or cheat and heat up previously frozen buns in the oven at 380 degrees. Remember to keep a close eye on them to prevent burning! Hope you have fun experimenting this week!